The genus name Coregonus means angle-eye, and artedi refers to pioneering ichthyologist Petrus Artedi. 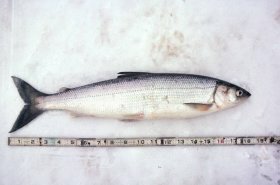 Other members of the genus Coregonus include lake whitefish, bloater chub, and five species of deepwater ciscoes that are extinct or extirpated from Lake Michigan. The cisco belongs to the same family as salmon and trout (Salmonidae). The common name “lake herring” is misleading because it is not a member of the herring family (Clupeidae), which includes alewife and gizzard shad. In Lake Superior, cisco mature at 9 to 12 inches and 2 to 4 years of age. They spawn as fall gives way to winter and water temperature drops to 40°F. Spawning generally occurs in the shallows of lakes over a clean bottom, although cisco also spawn in open waters of Lake Superior and in some streams. The cisco primarily feeds on microscopic zooplankton, but aquatic insect larvae, adult mayflies and stoneflies, and other bottom-dwelling invertebrates are also eaten by adults. Being a coldwater fish, the cisco feeds heavily under the ice. Grand Traverse Bay, Lake Huron, and St. Mary’s River are top locations for big cisco. Grand Traverse Bay produced the state record in 1992, a fish that weighed 5.4 pounds and measured 25 inches. Typical size is 10-14 inches, with fish over 16 inches qualifying for a Catch & Release Master Angler Award from the MDNR. Cisco are sometimes called “the canaries of cold water”. 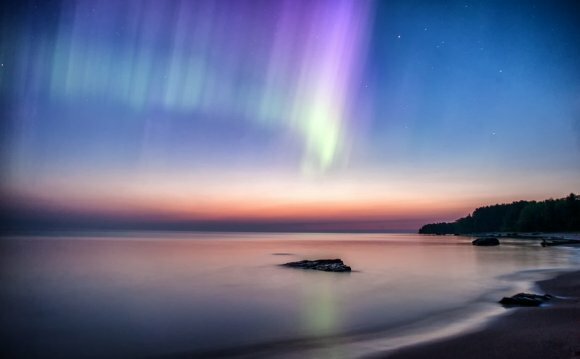 They do not tolerate warm water or low oxygen levels and have declined in, or disappeared from, over 20% of their native lakes in Michigan. Development and other land use change can lead to increases in the nutrient phosphorus. Increased nutrient levels accelerate decomposition below the thermocline of stratified lakes, depleting oxygen required for cisco to thrive. Inland lakes that do retain high water quality are often stocked with trout, which also require cold oxygenated water, or other gamefish. Stocking predators or competitors is also recognized as the cause of cisco decline in some inland lakes. The cisco is one of few species that is sought by recreational anglers and commercial fishers, in addition to being an important forage fish. Cisco are taken by commercial fisheries in Lake Superior and Lake Huron’s North Channel, and popular recreational fisheries exist on the St. Marys River and certain inland lakes. Teardrop jigs and small baits like waxworms or wigglers are effective through the ice and in open water. Fly fishing can be effective during the Hex hatch. With soft fins, fatty meat, and ideal size, the cisco makes a perfect prey fish. One study from Ontario found that walleye grew more efficiently, required fewer meals, and expended less energy in inland lakes with cisco as the major forage fish. Northern pike and lake trout also prey heavily on cisco where they are available.